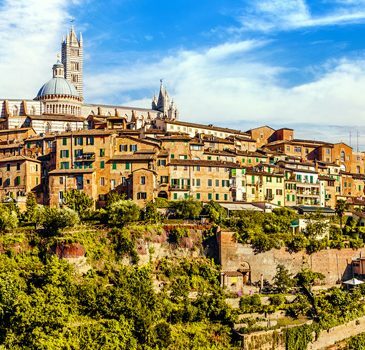 Siena must be visited strictly on foot and the city’s places of interest are all within a short walk, from the Cathedral to the Church of San Domenico, in a widespread invitation to slow down one’s pace in order to enjoy the pleasure of a personal discovery. Churches, small streets filled with artisan workshops, wine-shops and trattorias: you will discover a young city that moves among extremely ancient backdrops and that knows how to offer an intense experience, impossible to find today in modern cities made of glass and cement. There is also a lesser known Siena, underground and aquatic, and exceptionally evocative. The ‘Bottini’ represent a network of underground aqueducts of medieval age, which still today supply the city’s waterworks and that can be visited. Part of these aqueducts still carry water to this day, right below the foundations of the historical palace that houses the “Relais degli Angeli”. These and many other experiences and discoveries can be enjoyed during your holiday in Siena. We will be at your complete disposal in order to suggest the most interesting places to see and to organise your visit to the city and to the surrounding areas in the best way possible.